While the rapid growth of craft beer has created a dynamic and constantly evolving marketplace with beers rotating faster than ever on store shelves, in some retail shops, beers still have a tendency to sit on shelves past their prime. Freshness should be forefront in the mind of any craft-beer consumer buying hops-forward beers, since that’s the way the brewer intends for you to taste it. 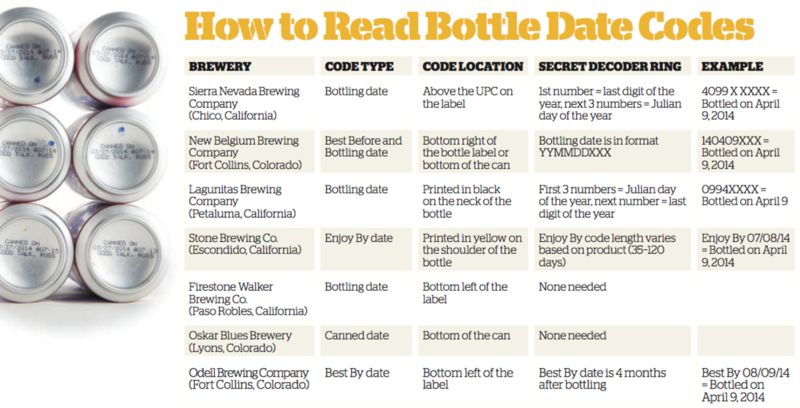 One of the most difficult tasks in checking beer freshness is locating the date code. First, check the label. 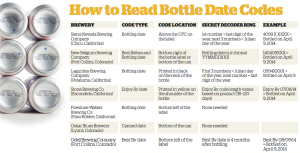 Breweries such as Sierra Nevada, Great Divide, and Odell clearly print the date code on a specific section of the label, which is often the same for all product lines. If you can’t find the code on the label, check the bottle or can. For bottles, date codes are often printed on the neck or shoulder (the section just above the label). These codes are easiest to identify when they are printed in yellow or white ink on the bottle, but black or dark ink is not uncommon, so hold the bottle up to a light source to help you find the code.